This printable is a "Beginner's Guide" to note-taking. 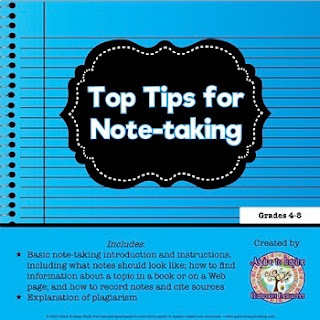 It introduces how to take meaningful notes, paraphrase, and cite sources with a focus on note-taking from written materials and Web sites. A definition and examples of plagiarism are included as well. This resource works well for mini-lessons on research and to complement to research projects. See this resource in action in the America: Culture Connections Group Newspaper.